Mars 2016, ouverture de jaja, bar à vin naturel à Berlin. Mit dem vibrierenden Wild Things, dem geschmacksintensiven Industry Standard oder der Wine-Rush-Reihe im Café der Biobäckerei Endorphina entwickelt sich Neukölln ja gerade zum Kernland jener neuen Weinbewegung, die es gerne ungeschwefelt, ungefiltert, handbearbeitet und vor allem entdeckungsdurstig mag. Add to bagDon’t let the current rays of sun and shine fool you, Berlin winters are the worst! THE WORST!! There are no upsides to freezing temperatures, dark days, low hanging clouds, having to wear the same black coat day in, day out, eating only apples and cabbage because nothing grows in this Siberian climate. But wait, what about long winter nights spent in cosy bars with loads of dark wine, some treats, and good friends to share your desperation with? Isn’t that “nice”? Ja, Ja … I mean, I guess one could call this a delightful way to spend the icy days… especially if natural wine comes together with delicious food in a suprime pairing at this bar in Neukölln one could say there are way worse places to be right now. First of May was a small glimpse into what summer will offer us (kids take your sunblock with you, I totally underestimated German sun last Sunday! ), and for those who enjoy a sunny afternoon with an Apéritif in hands, newly open JAJA Berlin is a good choice. Open since late March 2016 and run by French-German pair Yulja Giese and Etienne Dodet, Jaja is named after a somewhat old-fashioned French slang word used to describe everyday wine. 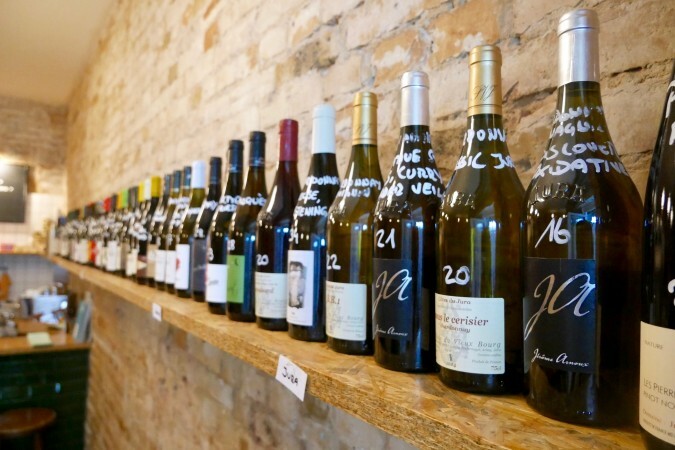 Located on Neukölln’s Weichselstraße, this natural wine bar offers an ever-changing selection of reds and whites as well as the occasional orange wine — a rarity.